Creating a positive employee experience is essential to creating a positive customer experience. 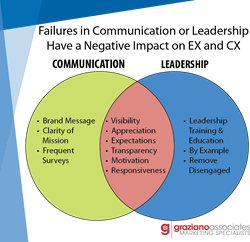 Graziano Associates connects the dots between EX, CX and brand loyalty with a new tip sheet. Brand ambassadorship begins on the inside of a company. Gallup estimates that only 34% of US workers are engaged in their jobs. One third of employees are somewhat engaged, and another third are disengaged. The disengaged group poses the most danger to a company by their actions, or lack thereof. Given those stats, it should be clear that employee engagement or EX should be as much as a priority as CX. Very often though, C-suite executives incorrectly view both of these initiatives as “nice to have” budgetary considerations. In reality these initiatives have a direct impact on revenue, retention and brand image. Thus, “many customer loyalty programs are destined to fail before they launch because enough attention has not been given to building enthusiasm for brand, message, mission and company loyalty on the inside of an organization,” says Graziano. Two of the root causes that undermine an otherwise well considered customer loyalty program are communication and leadership, especially where the two intersect. When companies fail to execute in these two areas, there will almost always be a negative impact with employees. Brand message and mission - it should be clear from bottom to top of the company and conveyed in myriad ways. In each instance above exists the potential for far-reaching problems in an organization. With respect to derailing a customer loyalty program, if your employees don’t feel that they are part of the success and mission of the company and cannot embrace the enthusiasm to create a positive customer experience, it’s an uphill battle from there to create loyalty. Failures in communication and leadership will also lead to issues with attracting and retaining top talent, which causes increases in operating costs, reduced productivity and a decline in the overall Customer Experience. The first step in any customer loyalty program must be to extend the same loyalty to your employees, your “front line” – that you extend to your customers. Employees should know that they are a part of the success of any customer-facing programs. Assess communication and leadership business practices with your employees’ experience in mind. Create Brand Ambassadors from within first, to ensure they share the enthusiasm you want your customers to expect when working with your organization. Click here to read the full text of this article. Denise Graziano is a leading authority in helping mid-market and larger companies to improve customer and employee experience. A strategic thinker and leader with 30 years of business experience, Denise is a speaker and author of numerous articles and resources on customer experience, employee experience, client retention, sales, and trade show practices. She is President and CEO of Graziano Associates, which helps fast-growing companies in the business-to-business market capitalize on customer and employee interactions — to deepen loyalty, improve engagement, and support sustainable growth.